Even though September is already here and summer like temperatures continue, we consider it to be fall fishing in Orange Beach. 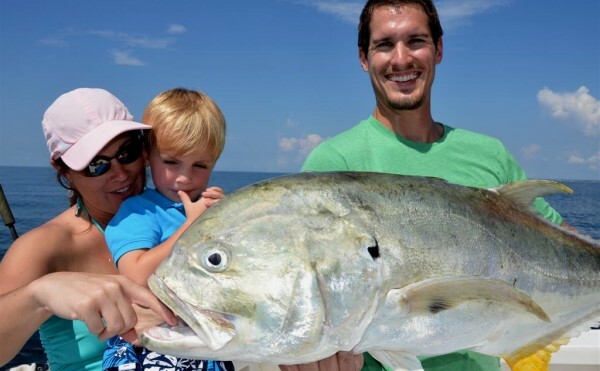 The fishing is not really any different than it was in August, but we captains and guides on the Alabama Gulf Coast look at it differently. We have worked all summer long and always look forward to slowing down and only running one trip per day or less. The fish are offshore reef fish are biting pretty good. 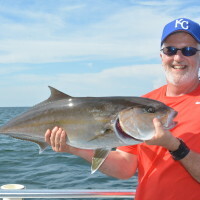 We are still catching and releasing Red Snapper but the Triggerfish we have caught have been bigger than usual. 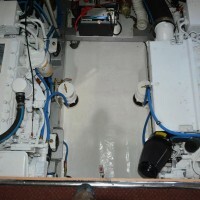 We are still catching or hooking a big shark almost every trip. The trolling trips have been a little different this year due to the huge influx of rain (49 inches for July and August). 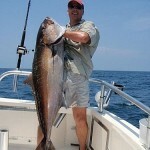 This has put a damper on the trolling fishing close to shore as compared to previous years. We are catching Spanish mackerel in the pass at Orange Beach and just outside the jetties. 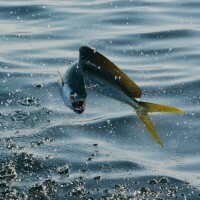 We are catching some monster Jack Crevalle’s while trolling offshore. Boy do they put up a good fight. Most of them are small, but we are finding the larger ones just offshore and out to about three miles. We are catching some King Mackerel but not like we have in years past. There are a bunch of 23 inch fish, which are about 1 inch short of the legal size that are biting. They sure are a lot of fun to catch and release. The reason the trolling bite has been different is because the salinity and the water clarity has been dirty all summer with a westerly flow from the waters leaving Mobile Bay and has pushed the bait fish further offshore. Logically thinking, no bait equals no fish. 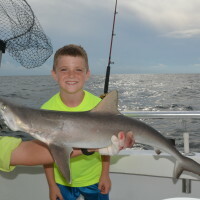 For that reason, our 6 hour deep sea fishing trips remain the most popular among families. If you are planning on coming to Orange Beach or Gulf Shores this fall and are planning a fishing trip, I would encourage you to at least go 6 hours.